The Mi7Smith Functional Training System is a completely innovative home gym that maximizes space by combining the MiSmith Dual Action Smith with the Mi7 Functional Trainer with a walk-through design to deliver a sleek and efficient gym unlike any other. With patented technology, the Mi7Smith is engineered to provide a wide variety of features to maximize your exercise options. 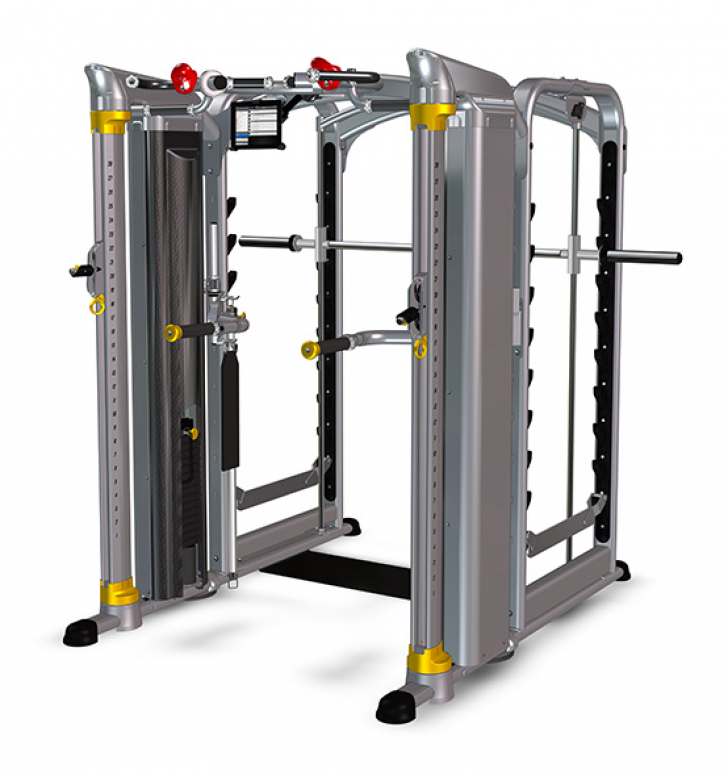 On one side of the Mi7Smith, the MiSmith Dual Action Smith features revolutionary patented technology that produces a simultaneous horizontal and vertical bar movement, providing the benefits of free weight training with added safety and stability. Walk through to the other side of the Mi7Smith and the Mi7 Functional Training System features dual Silent Steel® weight stacks with 360 degree rotating columns for completely free range of motion. accessories	 Adjustable strap handles (1 pair) for varying user heights & arm lengths. Assist strap for weight assisted pull-ups & lunges. Dimensions	 L47.75" x W54" x H83"
Warranty	 BODY/FRAME: 10 Years, STRUCTURAL MOVING PARTS: 5 Years, BEARINGS, BUSHINGS, PULLEYS: 3 Years COATING, CABLES, EXTERIOR UPHOLSTERY AND ACCESSORIES: 1 Year. Applies to defects from manufacturer only.